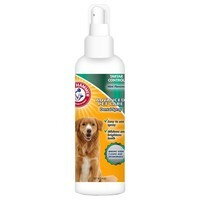 Arm & Hammer Dental Spray for Dogs is an easy to use method of helping to ensure even the fussiest of dogs has good oral hygiene. Specially formulated with baking soda and green tea leaf extract, the spray will fight and control tartar naturally, keeping your dog's teeth and gums clean. Easy use formula - no rinsing or brushing required. Stays on for hours after spraying and leaves a pleasant fresh mint scent.